Earthquake in Haiti – not a natural catastrophe! On Saturday 6 October, the earth trembled again in Haiti. This time, it was not in the capital Port-au-Prince, as was the case in January 2010, but more to the North-West. The quake had a relatively weak magnitude of 5,9 at the Richter Scale, at a depth of 15 kilometres, but still it caused considerable damage. About fifteen dead were counted, more than 300 people wounded, and dozens of houses destroyed or badly damaged. Above all, the earthquake created panic among the population, people expecting a much stronger shock to follow any moment. 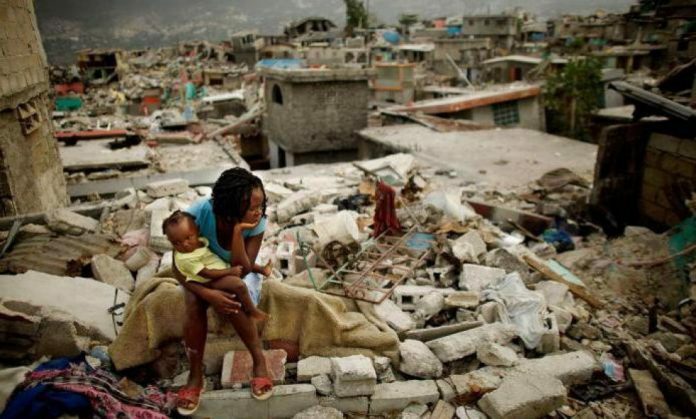 As we all know, Haiti is a country exposed to different natural hazards, in particular hurricanes and earthquakes. Each year there is the hurricane season between June and November, and frequently those hurricanes who pass by Haiti cause great suffering and incomparable losses. After the enormous earthquake in 2010, Haitians have a little bit forgotten that they live on fragile land, abraded on all sides by continental fault lines, but also by internal fault lines that could become active any moment. The structures that are in place for civil protection are mostly set up to protect people from hurricanes, floods and droughts, but little attention has been given to protection against earthquakes. However, throughout its history Haiti has seen several earthquakes. Cap Haïtien in the North was already destroyed in 1842 and has even experienced a tsunami. In the past, several other cities in the country have suffered from earthquakes, but with time passing Haitians seem to have forgotten these events. Both the State and the citizens forget that they live on fragile land and that appropriate responses are necessary to prevent natural hazards to turn into catastrophes. This is a matter of collective civic responsibility, and not of complacence and fatalism. The goudou goudou, as the Haitian people have named the earthquake of 6 October, is a call to order for the nation. 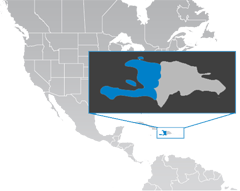 Haiti cannot change its geographical location – it is situated near the place where two tectonic continental plates meet. But its leaders and its population have the responsibility to adopt permanent measures and behaviour which enable Haiti to live with these realities without too much risk. This means that Haiti should consider its geography, the structure of its territory, and should accommodate its infrastructure, its housing and construction policy and its behaviour. Haiti needs to manage its risks. The different catastrophes which Haiti has survived over the past ten years are not just natural. They are the result of a lack of governance and of civil responsibility. Too few measures have been taken in response to the earthquake of January 2010: no public policy on housing and construction, no strong institutional structures to check the quality of new constructions, no territorial management to determine where and how people should build. Notwithstanding great human loss (more than 230,000 dead) and material loss, the Haitian public administration did not have the means to better guide and control urban development. Not one public sector has already integrated a risk management policy. Sure, there have been a few actions to make people aware of risks and to explain what to do in case of an earthquake. Here and there, individuals have made efforts to respect earthquake standards when constructing new buildings. But these initiatives remain weak, very limited and isolated. The means to comply with standards and to put instructions in practice are not available. Let us hope that the new earthquake which has hit the North-West of Haiti will contribute to a greater awareness among citizens and government leaders about the need to develop a culture of risk management in Haiti. Only in doing so, we can prevent natural hazards from turning into catastrophes every time.